MUMBAI: Here are the fresh new happenings from the world of Bollywood. So, relax and read on to know what you favourite B-town stars are up to. Actor Nikitin Dheer says he is honoured to be chosen by filmmaker Rohit Shetty and to get a chance to work with "prolific" actor Shah Rukh Khan in the film Chennai Express. Chennai Express completed five years of its release on Wednesday and Nikitin shared a still from the film, which he described as a wonderful ride. "Chennai Express completes five years today. A wonderful ride filled with invaluable moments. Honoured to have been chosen by Rohit Shetty the privilege of sharing the screen with someone as prolific an actor as SRK sir and the beautiful Deepika Padukone," he captioned the still. Nikitin essayed the role of a negative character named Thangaballi in the film. Chennai Express tells the story of Rahul, who has to immerse his late grandfather's ashes in Rameshwaram, unwillingly boards the “Chennai Express" (Shah Rukh) and finds himself entangled with Meena (Deepika), the daughter of a gangster. Actress Sonakshi Sinha has revealed why her family's bungalow is named Ramayan. After the performance of Indira Das, Sonakshi praised her. Indira's mother asked the Dabangg actress about the reason behind her bungalow named Ramayan, read a statement. Sonakshi said, "Many people have asked me the same question but for the first time I am revealing the secret. Me and my mother are outsiders in our house as my father and his three brothers are named - Ram, Laxman, Bharat and my father Shatrughan. "My brothers are Luv and Kush. So, Ramayan seemed like an apt name for our residence but at times we also get to witness Mahabharat inside Ramayan." Amar Kaushik, who will make his Bollywood directorial debut with the horror-comedy film Stree, says it is easier for filmmakers to experiment with their first film as people are not aware of their signature style. Asked why he chose this genre instead of a love story, Kaushik said, "I think it is easier to experiment with my first film because here people do not know my signature (style) as a filmmaker. With success, people begin to fear to experiment, especially when they establish their style of cinema, build a steady audience who love to follow their work. Commercially that becomes tough to experiment." "Since this is my first film, I am taking a chance with a good script, a bunch of great actors to tell a story written by Raj and DK. If it falls flat on my face, I would learn from my mistake and move on. Having said that, I am confident that people will love our film," added the director. "There are people who do not prefer watching an out-and-out horror film. They get scared. But comedy is something that we all get entertained by…so our film has the quirk to entertain you, and a little element of mystery and horror to thrill you," shared Kaushik. Stree will release on 31 August. Actor Sidharth Malhotra says essaying the role of Kargil war martyr Captain Vikram Batra is the toughest role of his life. Talking about the biopic, Sidharth said, "We will start that (working on the biopic) but before that, there is a love story of Balaji (Balaji Motion Pictures) in which I am working with Parineeti Chopra. We will start shooting for that film in the next two days in Lucknow. We will announce the title and other details of the film soon." "Then I will do the biopic on Vikram Batra. It is the toughest role of my life," added the actor, who unveiled 'The Webb Ellis Cup' at the Rugby World Cup 2018 Trophy along with actor Rahul Bose here on Wednesday. The 33-year-old said he needs to prepare more for the role. "I am preparing for it but it seems like I have to prepare more for it because it is not enough for the kind of character that I am playing," he shared. Sidharth finds it a huge responsibility to play Batra, who was posthumously awarded the Param Vir Chakra -- India's highest military decoration awarded for displaying extraordinary acts of valour during wartime. "I feel it is an emotional responsibility to play that character because the family of Vikram Batra felt that I can play his role so, it is a big responsibility to present their story on the big screen," he said. "Now Dharma Productions is involved in it and we have a really good director as well so, we are all very excited for it. We start shooting for it in a few months and hopefully, we will have a very good film," he said. Directed by Vishnu Varadhan, the yet untitled biopic is being co-produced by Dharma Productions and Shabbir Boxwala. Meanwhile, link-up rumours about Sidharth and actress Kiara Advani have been doing the rounds. The Ek Villain actor said that he is currently in a relationship with his work. "If you think everything is the truth when you read a newspaper, then how amazing it would have been. Right now, I am only in relationship with my work. I am super busy in that and I have no time to do other things," he said. Actress Kangana Ranaut, who is vocal about political and social issues, says she has no plans to join politics. "I think politics shouldn't be taken as a career. If somebody like me wants to join politics, then firstly he or she needs to renunciation all pains and pleasures of the material world, become as ascetic or bairagi," the actress said. "If you want to serve people then you have to give up your family and other things in your life, then only, I will be able to serve the country and that should be the intention. "At this point, I am very successful in my career so I don't want to make my career in another field." The actress, who is busy with Manikarnika: The Queen Of Jhansi, said, "If I have to serve for my land then there shouldn't be vested interests of mine because then there will be conflict of interests. "So, if people want to join politics they should but they must take 'bayrarya'." Kangana expressed her views about joining the political world while interacting on Wednesday night with the media at the "In Conversation with the Mystic 2018" session along with Sadhguru Jaggi Vasudevat. "I feel we should talk about present day conditions of our country and we should think about how we can unite this country. Most of my contemporaries don't talk about it. "Not long ago, a celebrity made a statement that we don't have water and electricity problem, so why should we talk about it? And it hurts. You cannot talk like that. What kind of an individual talks like that? You are a part of this country and it's not just about you." Kangana feels "artists often say that we shouldn't comment on certain issues otherwise, we will land up in controversies". "If successful people like you, for whom 25 media cameras gather at one point will not talk then who will talk about it? Then what's the meaning of becoming a successful human being? "You focus on earning money and enjoying your life. This is not the real way to lead a life. People haven't put you on a pedestal to only think about yourself. "People have put you on a pedestal so that you can think about them as well." Actress Nora Fatehi says she had a blast shooting for song "Kamariya" with actors Rajkummar Rao, Aparshakti Khurana and Abhishek Banerjee. The song will feature in the upcoming horror comedy titled Stree. "'Kamariya' is a wonderfully composed song. The concept for the video is so fresh and it's unlike anything I have done before... The whole song has this rustic visual. Plus, I had a blast shooting for it with Rajkummar, Aparshakti and Abhishek," Nora said in a statement. Talking about her look, she said, "The costumes are so quirky. I am wearing a sari which has been tied around my waist with sneakers and a sweater. My hair is messy." Nora Hopes she has done "justice". Stree also stars Shraddha Kapoor and Pankaj Tripathi. Presented by Dinesh Vijan and a Maddock Films production in association with D2r films and Jio Studios, the film will release on 31 August. Actress Tamannaah Bhatia says she had a great time shooting for a song titled "Jokae" with Kannada film star Yash for the film KGF. "Having a great time shooting 'Jokae' song with Yash. The team has made me feel so much at home, thank you guys. Watch out for 'KGF' very soon in your nearby theatres in Telugu, Tamil and Kannada," she tweeted. KGF is written and directed by Prashanth Neel and produced by Vijay Kiragandur under the banner Hombale films. Veteran actor Anupam Kher, who is shooting for the upcoming American drama series New Amsterdam, has called it a "compassionate medical drama". "Actors as doctors in slow motion look more confident and hopefully in control. With Tyler Labine at the shoot of 'New Amsterdam' - A compassionate medical drama," Anupam tweeted. Inspired by Bellevue, the oldest public hospital in the US, the series follows the brilliant and charming doctor Max Goodwin played by Ryan Eggold, the institution's newest medical director who sets out to tear up the bureaucracy and provide exceptional care. Producer Manish Goswami will soon open a preschool and daycare centre. Goswami, known for Aisa Des Hai Mera, Aashirward and Kittie Party, will open the playschool in western suburb of Mumbai. "It is my son Siddhant's vision and belief that we are about to realise. He had a unique concept to create a large warm space where we strive for our kids to know and grow," Goswami said to a leading publication. Singer Tulsi Kumar says she is excited to perform in the UK for the first time. The singer will perform live with singer Guru Randhawa as part of ‘High Rated Gabru UK Tour 2018'. "I am really excited to be part of the UK tour along with Guru Randhawa for one of the biggest musical concerts. This is my first live concert in the UK," Tulsi said in a statement. The daughter of late Indian music mogul Gulshan Kumar will be performing in five cities across the UK from 1 to 10 September. "We will be touring to different cities in the UK. I have a surprise element in store for all my fans and looking forward to them singing along with me," she added. Deepika Padukone and Ranveer Singh are the most loved couple of Bollywood. While they have been in news since their dating rumours began in 2013, Deepika and Ranveer indulge in PDA on their social media pages. The duo comment on each other's posts in the cutest and naughtiest way which make people blush instantly. 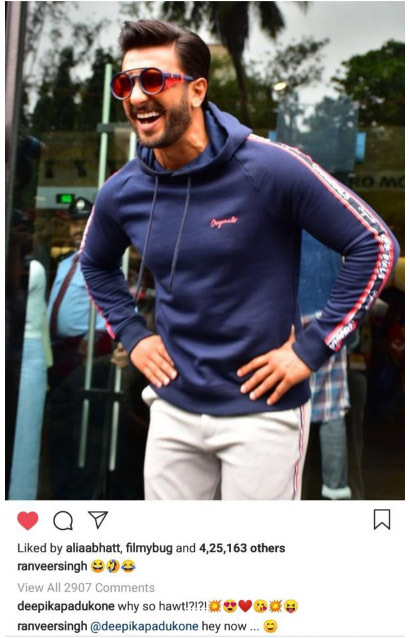 Today, Ranveer shared a photo on his Instagram page where he looked handsome, Deepika instantly commented on the post saying, "why so hawt!?!?!" To which, Ranveer replied, hey now ..." Aren't they cutest? !